While many blame the recession for 2009's poor gaming performance, Shigeru Miyamoto has another answer: lack of fun. In a recent interview, Miyamoto said the entertainment industry is less vulnerable to economic recession, so if it does poorly, the blame rests solely with the content provided. "The fact that in 2009 we were not able to sell more than we did in 2008 was simply that in comparison, we were not able to produce fun-enough products. There are always ups and downs in this business. As long as we create unique and unprecedented experiences with video games, there should be nothing to worry about," Miyamoto said. Despite the poor performance Miyamoto said he is confident the industry will pick back up, citing "enormous and unlimited opportunity" for developers to succeed. "There is no fixed demand for entertainment in general, and videogames are not an exception. As long as we can create something new, which can offer some unprecedented experience, there is always demand we can create," Miyamoto said. 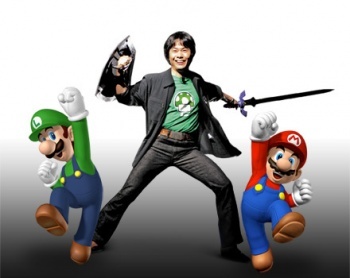 The changing climate of console release is allowing for increased creativity, Miyamoto said. The past few console generations were competitions to bring forward the most powerful machine, but the focus is now shifting to what the hardware can produce. This allows for more focus on the content, which will allow for more innovation on the developer end, he continued. While Miyamoto is definitely right in placing blame on a lackluster game lineup, I wouldn't be so quick to dismiss the economic situation. Still, I do approve of his message. If games aren't selling well, make them better. That way, we all win.